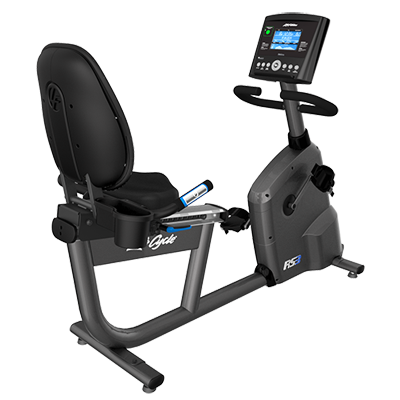 Buy Life Fitness RS1 Recumbent Lifecycle Exercise Bike w/ Go Console - FREE SHIPPING! Added workout variety and advanced programs to help you better reach your fitness goals. *iPod not included. See a larger image of the Go Console. EZ Incline/Resistance Slowly and progressively increases incline so you are less aware of the building demands. Fat Burn A great workout for beginners or for those days when you need a lighter workout. Automatically adjusts resistance to maintain your heart rate at 65% of your theoretical maximum. Heart Rate Hill™ An interval workout made up of three hills with each hill becoming progressively more difficult based on your heart rate goals. The first hill is 70% of your maximum heart rate (HRMax) and becomes progressively tougher (75% HRMax on the second hill and 80% HRMax on the third hill). The valley is always defined as 65% HRMax. Similar to training for sports activities such as hockey, basketball, and soccer.